But what does this mean for charities exactly? Well, for most charities with total income of up to £1,000,000 there is the choice of having an independent examination of their accounts rather than a full audit. The technical view of an independent examination versus an audit is that a statutory auditor is required to a “positive opinion” as to whether or not the statutory accounts give a “true and fair view”. By contrast, an Independent Examiner forms a “negative opinion” that states (if this is indeed the result of their work) that no evidence of lack of accounting records or compliance of the accounts with those records. In order to form the positive opinion that is required of the statutory auditor, they need to perform significantly more testing and review than is generally required of an independent examiner, in order to obtain the evidence that supports that opinion. Staff time – less time will be spent between the reviewer and staff in order to complete the accounts scrutiny. Staff can in turn use this time on running the charity. Fees – typically, an independent examination could cost up to 40% less than audit in actual fees payable by the charity. Does an Independent Examination really provide sufficient independent scrutiny? Whether this level of scrutiny provides sufficient assurance for the particular stakeholder is a matter to be discerned internally by each qualifying charity. 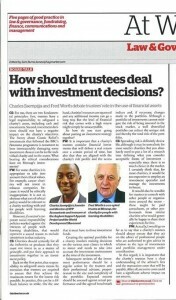 However I have found that most stakeholders would appreciate the cost savings and opt for an Independent Examination. And where further assurance is required by a given donor, a grant audit can be arranged for their grant (the cost of which is often build into the grant itself in full). Other considerations for independent examinations: Which charities are eligible for Independent Examination? In England and Wales (there are different thresholds for Scotland and Northern Ireland), a charity would be eligible if it passes two sets of tests. For accounting periods ending on or after 31 March 2015, the charity has total annual income not exceeding £1,000,000 (this also applies to aggregate income where it is a group); and (b) the charity has gross assets not exceeding £3,260,000. A charity would still be considered a small charity if it had gross assets exceeding the asset threshold but where its income is below £250,000. (NB: if gross income is above £250,000 and gross assets exceed £3,260,000, then an audit would be required). A very Happy New Year to you all from NfP Accountants! 2013 has been an interesting year. By the end of the year, it certainly felt like staying on the right side of the Charity Commission (as Wendy Cotton puts it) is something that no charity can afford to lose sight of. In the 2012/13 report on Tackling abuse and mismanagement by the Charity Commission, the sector regulator has pledged to take tougher actions going forward, and not just for late accounts filing, but also with respect to fraud, money laundering, governance, and other cases of charity mismanagement. Donations of goods: The year has seen a number of changes in the administration of Gift Aid. From April 2013, a single gift aid declaration was allowed for multiple donations of goods to a charity for resale (e.g. to a charity shop), to cover sales proceeds of up to £100 if the charity operates the shop directly, and £1,000 if the goods are sold by a trading subsidiary. Small donations scheme: From 06 April 2013, the Gift Aid Small Donations Scheme was introduced, to allow charities to claim gift aid on small donations without a Gift Aid Declaration. A short Q&A and worked examples are available here to help explain the scheme. Using an online form: A list of donors and Gift Aid claims can be uploaded on an online form using a model spreadsheet. This allows up to 1,000 donors at a time. 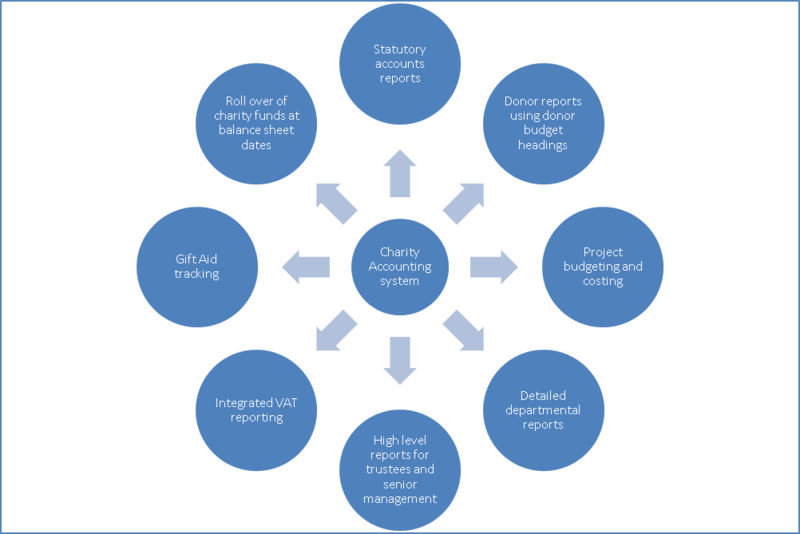 Using a compliant donor management database, which would allow the charity to claim for up to 500,000 donors at a time. Later in October, Comic Relief offered other charities free use of its Gift Aid software, which was developed to work with the new HMRC system. The software can be accessed here. Please note that at the time of writing, this free software could not be used for claiming on the Gift Aid Small Donations Scheme and it did not support payload encryption. Using a new paper form ChR1, which can be requested from the HMRC Charities Helpline. The Charity Finance Group published a useful guide on the new system, which can be accessed here. Further guidance can be obtained from HMRC here. Many charities will have noticed changes in the Annual Return in 2013. Additional information was now required such e.g. whether the charity was registered for gift aid, and some previously optional information was now mandatory. In 2014, it is expected that the Charity Commission will scrap the summary information return and will also display information about payments to Trustees on the online register. use payroll software to send this information electronically as part of their routine payroll process. There are relaxations for “small businesses” allowing them to report once a month (even if they pay their employees more frequently) until April 2014, when they will be required to comply in full. Click here for more details and guidance on RTI from the HMRC website. Employers have new legal duties to automatically enrol certain members of staff into a pension scheme and make contributions towards it. This is in order to encourage workers to save for their retirement. It is a staged requirement, which started back in 2012 for the largest employers first. Each employer has an allocated date to on which they must enroll their eligible staff. This is called a ‘staging date’. Click here to find your staging date. Please note that you will need your organisation’s PAYE reference. Jobholders can choose to ‘opt-out’, but this can only be done after they have been enrolled in the first place. An organisation cannot choose to not enrol eligible employees on the basis that they have opted out. There’s a detailed Q&A on auto-enrolment here. Further guidance and information for employers, trustees, and individuals, and on getting ready for auto-enrollment is also available on the Pensions Regulator’s website. On 16 September 2013, the Charity Commission published revised public benefit guidance for all charities. The new guidance helps explain and clarify the public benefit requirement for charities, having regard to the public benefit requirement when running a charity, and reporting on public benefit. The new public benefit guides are available on the Charity Commission’s website here. On 9 July 2013, a consultation was launched by the regulators on a new Statement of Recommended Practice, which provides a comprehensive framework for charity accounting and reporting. The process closed on 04 November 2013, with over 1,600 voluntary sector representatives having taken part in the 26 consultation events. The new SORP is due to be published in 2014 and is expected to come into force in line with FRS 102 for accounting periods starting on or after 01 January 2015. NfP Accountants will be sure to bring you the key changes for small charities once the new SORP has been published. There are already some great insights into what new regulatory changes we can expect in 2014. Some of these are included above, and there are some highlighted in the Autumn Statement (there’s a summary of key points for small charities here). Please note that the information above is only intended to help small charities keep up to date with key regulatory changes, and specific advice should be obtained before taking action, or refraining from taking action, on any of the subjects covered above. Posted in Regulatory updates	| Tagged Charity regulatory framework: key changes in 2013 for small charities. From 06 April 2013, HM Revenue and Customs introduced the Gift Aid Small Donations Scheme, to allow charities and Community Amateur Sports Clubs to claim Gift Aid without a completed Gift Aid Declaration on small donations. The Gift Aid Small Donations Scheme (GASDS) was introduced on 06 April 2013, to allow eligible charities and Community Amateur Sports Clubs (CASCs) to claim Gift Aid on small cash donations, where it is difficult to collect a Gift Aid declaration. An example is cash collected in street collections or at religious services. Your charity or CASC does not have to know the identity of the donor, unlike with Gift Aid, payments under GASDS are not a tax relief and there is no audit trail back to the original donor’s tax record. You don’t have to collect Gift Aid declarations from your donors for GASDS. Did the GASGS replace the Gift Aid Scheme? No. The scheme is in addition to Gift Aid. Can my charity claim under the GASDS but not under the Gift Aid Scheme? Your charity or CASC still needs to make regular Gift Aid claims in order to be able to claim GASDS payments. You can still claim Gift Aid on donations under £20 and, unlike GASDS, there is no limit on the amount of donations on which your charity or CASC can claim Gift Aid relief. A donation on which a Gift Aid declaration is given to a charity or CASC cannot be a small cash donation for the purposes of the GASDS. If you haven’t made a Gift Aid claim before, or you haven’t claimed for some time, follow the link below to find out more about the Gift Aid scheme for charities and CASCs. How is the amount the charity can receive from HMRC calculated? GASDS is not a tax relief (like ‘normal’ gift aid). However, the payment is calculated in the same way as a Gift Aid payment even if the GASDS is not a form of tax recovery. Payments to charities and CASCs under the Gift Aid scheme and the GASDS are based on the basic rate of income tax for a tax year. So where the basic rate of income tax is 20 per cent, small donations of up to £5,000 a year will entitle the charity or CASC to a top-up payment of £1,250. The scheme applies to cash donations of £20 or less, received after 6 April 2013. Is there a limit to how much can be claimed? Most charities can claim Gift Aid on up to £5,000 of small cash donations in a tax year, giving a total of £1,250 in the GASDS for the tax year. However this claim limit may be restricted by the charity’s circumstances e.g. where it is connected to other charities, or if its income is below or above £5,000. Follow this link to use the ‘How much can my organisation claim under GASDS?’ flowchart to tell you if your charity or CASC may have a different claim limit. If your organisation is recognised by HMRC as a charity or CASC for tax purposes and makes claims under Gift Aid, it needs to meet 3 conditions to qualify: the start-up period requirement, the recent claims condition, and the penalties condition. What is the start-up period? In order to qualify, the charity or CASC must have existed for at least two complete tax years (6 April – 5 April). This period is calculated from when the organisation was recognised as a charity or CASC for tax purposes rather than when the organisation registered with HMRC or started operating. What is the recent claims condition? In order to qualify, the charity or CASC must have made at least two successful claims (non-GASDS claims) during the previous four complete tax years, and there must not be a gap of two or more tax years between those claims or since the last claim was made. For this condition, the tax year to consider is the one in which you make the Gift Aid claim, not the year in which the donations that you are claiming Gift Aid repayments on were made. Gift Aid claims can be made up to four years after the end of the tax year that the claim relates to. NB: The condition is that you have 2 successful claims, so the charity would still qualify if this is met, even if it also had unsuccessful claims or penalties (see below) in the same tax year. What is the ‘no penalties’ condition? If a charity or CASC incurs a penalty in respect of a Gift Aid or GASDS claim, it will not be eligible to claim top-up payments under the GASDS for either the tax year in which that claim was made or the following tax year. However, successful Gift Aid claims made in those tax years will still count in determining eligibility in subsequent years. My charity’s financial year is not coterminous with the tax year, when do we become eligible? Can my donors claim tax back higher rate tax under the GASDS? No. GASDS is not a tax relief, so higher and additional rate taxpayers will not be able to claim tax relief on their GASDS donations. Can I claim for small donations received before 06 April 2013? No. The scheme applies only to small cash donations received on or after 6 April 2013, so any donations received by your charity or CASC before 5 April 2013 will not qualify under the GASDS. Click here for further guidance and information from the HMRC website. Click here to see worked examples of how the scheme operates in practice. The Autumn Statement 2013 took place on 5 December 2013. The statement provides an update on the government’s plans for the economy based on the latest forecasts from the Office for Budget Responsibility. Here is a round up of the key messages for charities. The government wants as many eligible donations as possible to attract Gift Aid, and will establish a new working group to revise the model Gift Aid Declaration to make it easier to understand, and to develop new promotional material to increase take-up. The government also intends to allow intermediaries to take a greater role in operating Gift Aid in order to reduce the number of instances where a new Gift Aid Declaration is given. However, following feedback from charities in the recent consultation exercise, it will consult further on the detail of how this can best be achieved, before changing legislation. In the Finance Bill 2014, the government will amend legislation underpinning the Cultural Gifts Scheme to ensure that estate duty is brought into charge where appropriate. HMRC will develop a new IT system to allow organisations wanting to register with the Charity Commission for England & Wales and seeking charity tax status with HMRC to submit their applications through a single online portal. The new system is planned to be introduced in 2015 to 16 and will later be extended to enable charities in Scotland and Northern Ireland to register with their charity regulators at the same time as they apply to HMRC. Government to provide additional support to the retail sector through a business rates discount of up to £1,000 in 2014-15 and 2015-16 for retail properties (including pubs, cafes, restaurants and charity shops) with a rateable value of up to £50,000, and a 50% discount from business rates for new occupants of previously empty retail premises for 18 months. Legislation will be introduced in Finance Bill 2014 to amend the definition of a charity for tax purposes to put beyond doubt that entities established for the purpose of tax avoidance are not entitled to claim charitable tax reliefs. Visit the government topical pages on the Autumn Statement 2013 here. A new brand of accountancy business for small charities and not for profit organisations, such as social enterprises, has been launched. There are thousands of small charities and social enterprises in the UK, doing fantastic work, and yet, many are still struggling to keep on top of their books or make use of their financial data for management decision-making. Although there are many accountancy firms serving the charity sector in the UK, NfP Accountants is set up to become the first employee-owned accountancy business. “It’s time to move beyond the traditional partnership model of accounting firms; for small charities and social enterprises, a more co-operative approach to financial management is best placed to provide the much needed support and at a reasonable cost”, says founder, Charles Ssempijja. NfP Accountants Ltd will provide all manner of services to small charities and social enterprises. What’s unique about this firm is that small charities will now have an accountant that can work with them to build processes that connect finance with other strategic and operational management, particularly around donor management, project tracking, process automation, and jargon-free financial information for the non-accounting manager.